More than a year after the service launched in the US, UK consumers can finally ask Alexa to please order them a pizza from Domino's. The skill was created by We Are Social and it allows customers with an Easy Order profile to place an order for their pizza by asking Amazon's Alexa voice service to "launch Domino's". Domino’s AI personality, Dom, is also reportedly on hand to respond to customer queries through the Echo with a "quirky, fun tone of voice that reflects Domino’s brand positioning". Don't expect Dom to speak in his own voice however; he still has to use Alexa's. "Dom is the entire copy, it's everything the skill says," Tom Ollerton, innovation director at We Are Social, said. Dom is also still rather limited in the types of queries he can handle. At present you can pretty much just order a pizza and track your orders. "We were keen to get it to market as a minimum viable product, and look at the data to see how people were using it. It will evolve based on how customers want to use it. Also, we'd rather launch with a simple but perfectly working skill on Echo than try to have 19 different things that may or may not do what you want," Ollerton said. Domino's has a reputation for inventing ways for customers to order pizza. From Dash buttons in 2015 to last year when the brand worked with We Are Social to launch @DomThePizzaBot which enables people to order pizzas via Facebook Messenger. 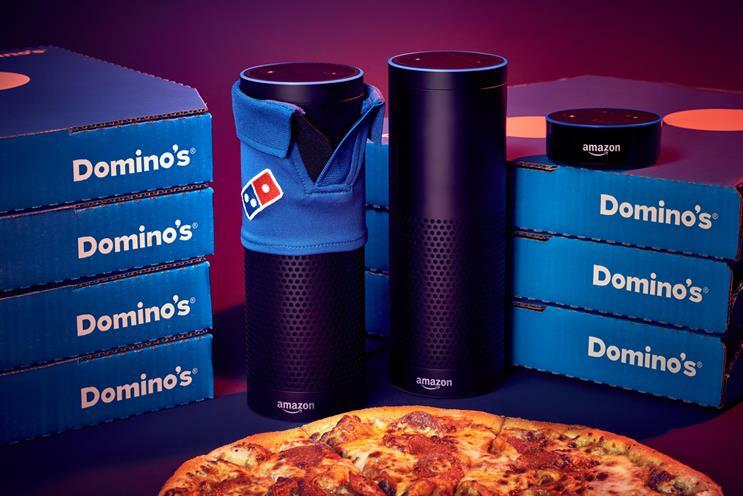 "The Amazon Echo is growing in popularity, as people continue to embrace the use of voice recognition technology in their homes," Hayley Tillson, senior digital marketing manager at Domino’s, said. "Ordering through the Echo gives our customers another way to get their hands on our pizzas quickly and efficiently at home, using latest technology."